← Three Years in a Row! 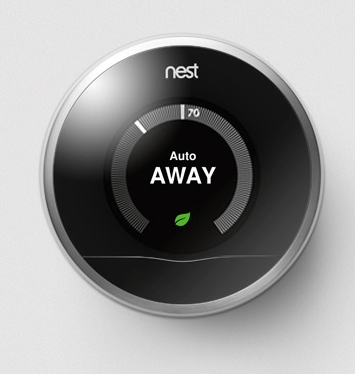 If you are looking to save money on your heating bill this winter, the Nest thermostat is a great way to start. This thermostat automatically learns what temperatures you like in the house and when, and sets itself up to auto-schedule. That means no programming for you at all. The thermostat even senses whether you are in your house at all, and adjusts the temperature accordingly so you aren’t heating an empty house (or cooling one in the summer). A leaf icon on the thermostat lets you know if you are saving money by changing the temperature, and you can even adjust it remotely from your smart phone or tablet. The newest updates Nest has made make it an even more useful gadget to have in your home. Beyond simply adjusting the temperature of your home, you can press the ring on the thermostat and have it tell you the weather outside. Nest has also enhanced the auto-scheduling of the device so that it will save you up to 6% more on your heating bill now. Nest now catches on faster to schedule changes as well, so it won’t be turning your heat down while you are home for the holidays when you would normally be at work. Finally, the new update brings a system test feature for you to test whether your system is functioning properly. Hopefully, some of these new updates will help with some of the old problems such as taking hours to turn the heat up two degrees because that is the most cost-efficient. Either way, those who were happy with their Nest thermostat before will be even happier with the updated features. The Nest learning thermostat continues to be one of the best options out there for making your home more energy efficient. Have questions about Nest? Give us a call at 704-450-4401!